I&apos;ve been working much more than usual this week which has turned the children into faint outlines in my memory for whom I have to make packed lunches for early in the morning and clean out the ravaged lunchboxes in the evening when they get back from summer club. Bee is taking over the lunch duties this week as she has now given up on work for August and I&apos;m thrilled. As if getting up in the morning isn&apos;t traumatic enough, trying to cram some limp ham into a few slices of bread to an orchestra of dissatisfaction at the lack of lunch imagination is not my idea of a gentle start to the day. I&apos;m always dissapointed my morning doesn&apos;t begin to the gentle wafting of a string quartet&apos;s notes to rouse me, followed by coffee, perhaps a rose-scented madeleine or two and a freshly ironed newspaper. Every bedtime I&apos;m full of childish and futile hope that the morning will one day surprise me. Perhaps when we go on holiday. Saturday saw me though, in the spirit of being pampered, undergoing a little shiatsu to unlock the &apos;qi&apos; that I thought had been thrown away a long time ago, or at least lost somewhere behind the sofa. Her verdict was my hands were very tense. Although mostly I was tense at how close she was to the fruit and veg department, and how she seemed to enjoy kneading my bottom rather enthusiastically, leading to worries of the wind section stating to play at any time without warning. But, eventually I relaxed. And after a long, lazy afternoon like that, you don&apos;t want to sully yourself with long and complicated meals. Sometimes, a quick ham and egg on toast makes a great supper, sometimes a quick bowl of pasta with butter and cheese. This recipe fits those moments perfectly if you&apos;re not after a huge feast but fancy something interesting. It also makes a perfect side dish for a barbecue too, so suit yourself. Bee introduced this to me a few years ago and it&apos;s as delicious and trashy as ever. No-one really needs mayonnaise and cheese together on a corn on the cob, but once you&apos;ve tried it, it&apos;s hard to go back. And if you&apos;ve recently had to be peeled off the ceiling after a small Polish woman has prodded you in spots that felt like she was using an electric cow poker you may need a little treat like this. Boil the corn in salted water until cooked then drain. Try and find the corn forks, find one complete and one broken then give up. 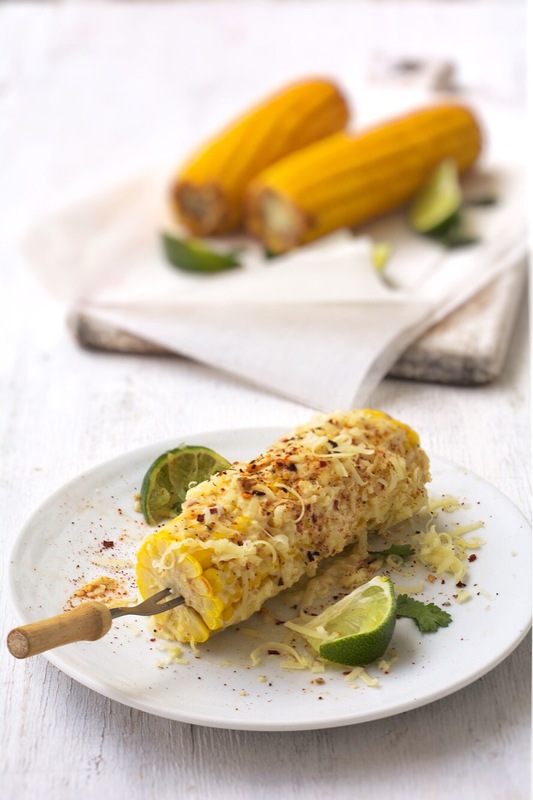 Spread each cob with mayonnaise, roll in the grated cheddar, season with pepper and squeeze over the lime juice. Add the chilli powder and flakes if you like it hotter and serve immediately with coriander. It really couldn&apos;t be much simpler.